StarDrone Extreme is a bit of an oddity. Hailing from Eastern European indie house Beatshapers, it’s pitched as a “high-speed action thriller with a mix of arcade action, pinball, breakout, physics and collect-the-objects”. That’s a pretty wordy bit of marketing, so let’s just classify it as a “flinging” game to keep things simple. StarDrone originally hit the Playstation 3 last year with Move support in tow with little fanfare to relatively mixed reception. 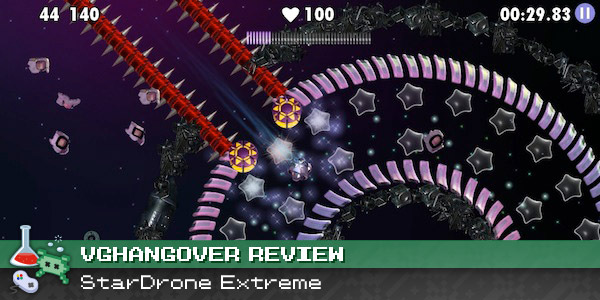 Now, the slightly tweaked StarDrone Extreme has made its way to the Playstation Vita. In the game, you indirectly control a constantly-moving spaceship by tethering it to nearby beacons, releasing the tether, and flinging the ship into the desired direction. In each stage, you’ll be picking up collectibles and trying to keep up your momentum – and thereby your multiplier – and finish in the shortest time possible in order to earn a higher score. It’s simpler in practice than it first sounds, but if you’re feeling confused, just watch the trailer below and you’ll get a basic understanding of how it plays. In the original PS3 iteration, this tethering mechanic was controlled by pointing the analog stick toward a beacon and holding a button or by using the Move controller to point toward a beacon and holding a button. Evidently, “extreme” is marketing-speak for “touch controls”, because the different input method is the only discernible major difference between Extreme and its predecessor. In the Vita version, you use either the touchscreen or the rear touch panel and tap to tether to nearby beacons. Both options work pretty well, but I found myself favoring the rear panel if only to avoid partially obscuring the screen with my large, manly hands. Although I had no real problems using the touch controls, I was a bit disappointed to find that traditional stick and button controls weren’t even an option. It just seems like an odd choice when the original PS3 version already had it in there. The entire package tends to feel a little bit bare bones, but these are some really sturdy bones. The controls are solid and responsive, the visuals are interesting without being overwhelming, and the short length of the stages make for great pick-up-and-play action on a portable platform. 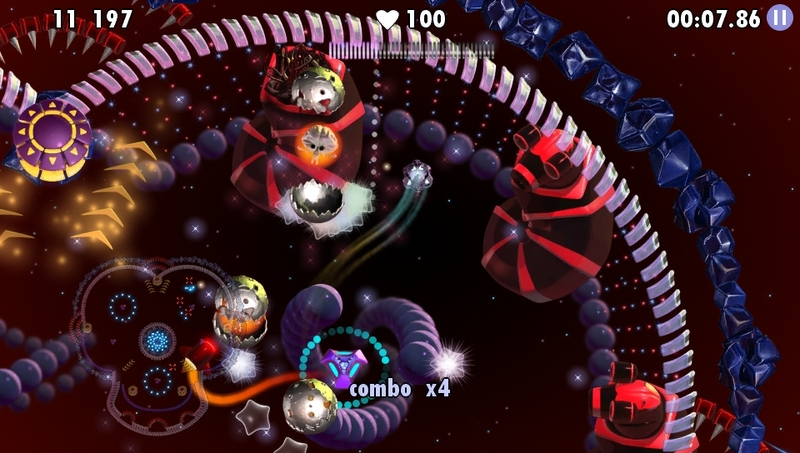 The game also supports cross-continuous gameplay, insomuch as you can upload your save data to the cloud and pick up your progress on the PS3 version, and vice-versa. 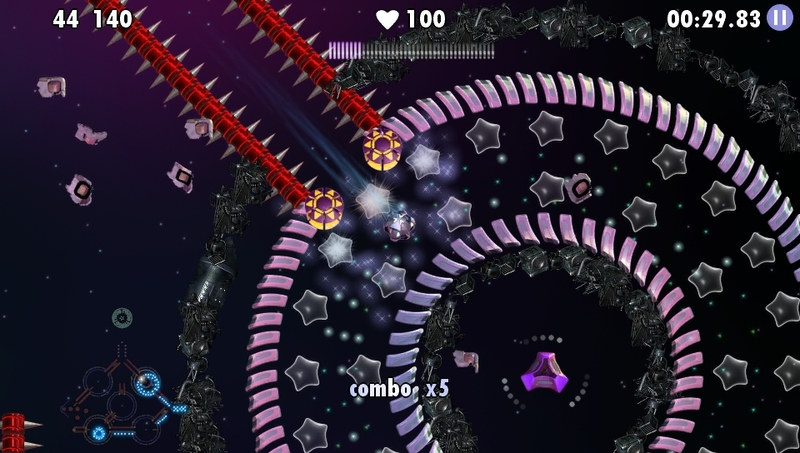 Beatshapers recently even lowered the price of the PS3 version of StarDrone, further easing the ability to placeshift your game progress. 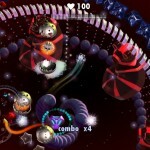 StarDrone Extreme may be just a fling, but it is a fairly unique entry in the arcade-style score chasing genre. While it didn’t exactly set the world on fire the first time around, Vita owners absolutely should give this new iteration a whirl. This is exactly the type of the game that the platform so direly needs right now – fun, bite-sized chunks of gameplay in a very reasonably-priced package. 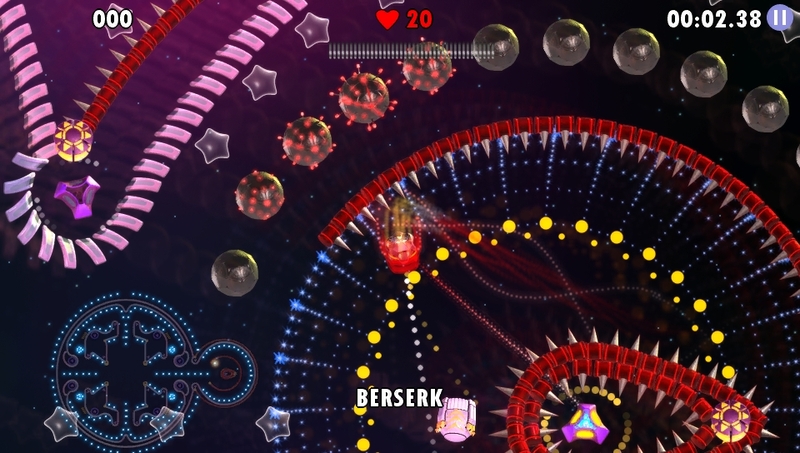 Reviewer’s note: Upon release, StarDrone Extreme featured a 99-cent in-game purchase that would allow the player to skip levels. 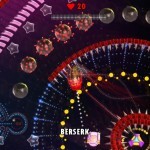 Some people seemed to take exception to this idea and Beatshapers has since made the level skipper DLC free. 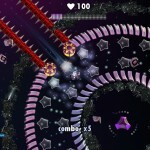 StarDrone Extreme was provided for review by Beatshapers. It is available from the Playstation Store on PlayStation Vita for $4 and its predesscor is also available on Playstation 3, also for $4.